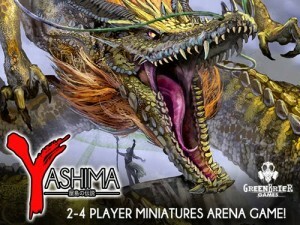 Games on our Table takes a preview look at Yashima from Greenbrier Games as well as posts up a small interview with one of the creators. It's originally in Italian, just so you know. This game of fighting for miniatures , from oriental flavor , is currently on Kickstarter and is getting good success. For 2-4 players (but with the new thumbnails even more), 60-120 minutes , is based on a fast deckbuilding and essential but very characterizing (is on the model of Smash Up) and has an essentially mechanical card-driven . There is a billboard esagonato with different types of land, on which they move the thumbnails of the combatants, paying attention also to the orientation of your face, which affects the range of attacks scored and conceded.